There is a saying in this tradition: “We rise by that which we fall.” Anandamayi Ma said that the floor that we fall on is the same floor that our hand will use to push on and help us rise up. Somebody wrote today on our community platform that all karmas are negative, or no karmas are valuable. This isn’t true at all. Karma means a habit pattern. It means a pattern of consciousness and energy that moves through time and that has momentum. It repeats itself. And it gains energy and it repeats itself. You could say there’s almost a kind of compulsion with which it repeats itself. 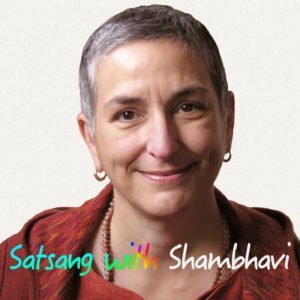 When we’re doing sadhana, we are replacing our daily routine of waking up at 9 am, or whenever we wake up, and having a lousy breakfast that we’re very attached to… Fruit Loops and coffee. [laughter] I’m a mind reader. So we have routines, especially like when we wake up, and we have routines of how we do things during the day, and how we eat, and how we relate. We have all these routines. However, those routines are exhausting our body, energy, and mind. They’re depleting us. They’re causing us to be less nourished in all sorts of different of ways. When we’re doing tantrik sadhana, what we’re doing is we’re saying, okay, those routines represent a capacity to establish routine. They’re not just something “bad.” They’re actually expressing a capacity that we have to create a pattern that gains momentum in time. So, we’re going to take that capacity, and we’re going to apply it to something that’s more nourishing and ultimately more fulfilling.